Merry Mondaymas to you, dear reader, and welcome to the least popular of all my weekly posts, News Monday. Maybe I should get some decent frickin’ news-worthy events going on in my life, eh? I have no gigs, anywhere, on this week. Boo. But I do have some news! Last week we finally announced the new season of Homework! Have you been before? It’s the monthly literary cabaret night I run in London, 6 months of the year, with Ross Sutherland, Luke Wright, John Osborne and Joe Dunthorne. Previously, special guests have included Kevin Eldon, Nick Hornby, Jon Ronson, Kate Nash, Johann Hari, Scroobius Pip and Tim Key. We have done shows about video games, movies, viral videos, we hired a boat and went up and down the Thames – we even got the audience to dress up in Tom Cruise masks and chant his poem from Cocktail. Nobody quite knows what’s going to happen, least of all us, but it consistently offers some of the best gigs of my career, and I couldn’t be happier that I get to be part of it for the sixth year running. Each of the six nights sees us, the Homework residents, trying out new material on a theme. It’s only a fiver. Ross made a flier for it! 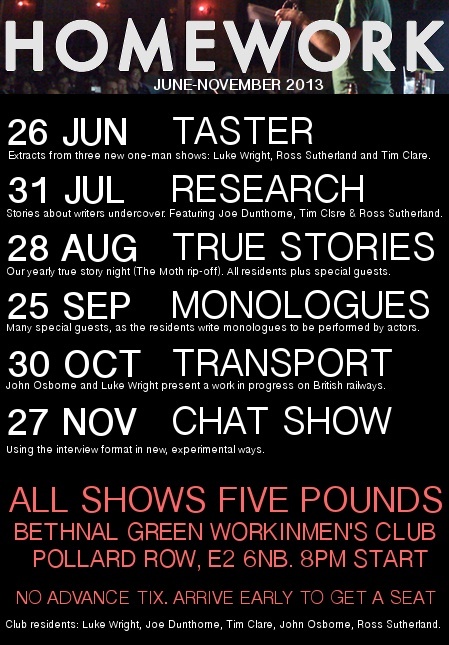 If you can make it down to London for one of these dates, please come. Unless you puncture a kidney during the journey or you miss the birth of your first son or something, I guarantee you won’t regret it. Laputa: Castle In The Sky. It was one of the few Ghibli movies I hadn’t seen, so I rented it out for me and my wife. Well, for me, mainly, but I hoped she might like it too. I liked it so much, you guys. It’s a beautiful story, full of wonder, about plucky orphan Pazu, and a girl who falls from the sky into his little mining town. Soon they embark on an adventure to find the fabled floating city of Laputa, chased by sky pirates and the army, who want the supposed lost technology of Laputa for themselves. Sounds pretty generic, I know, but every moment is executed with such brio and love that your heart would have to be made out of pure poo for you not to fall completely under this movie’s spell. It reminded me of why I want to tell stories, of why I picked up a pencil all those years ago, scribbling pictures and fragments of words, trying to recapture something of the boundless, glimmering realms of the imagination. Wow.